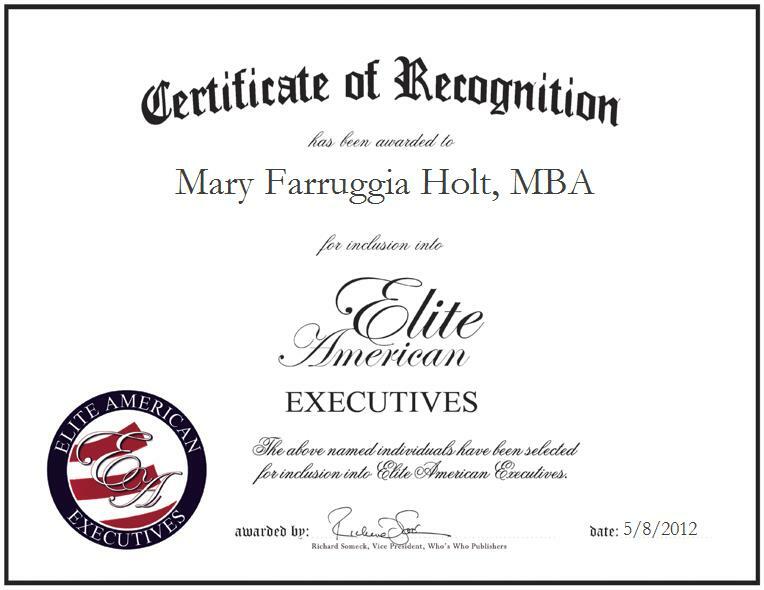 ← Nelson L. Moody Sr.
HANOVER, MD, May 8, 2012, Mary Farruggia Holt, MBA, Chief Executive Officer of Cedar Winds Properties, LLC, has been recognized by Elite American Executives for dedication, achievements, and leadership in real estate services. Ms. Farruggia Holt has been committed herself to providing high quality service to the real estate industry for nearly three decades. Attributing her success to sheer hard work, she strives for excellence in her every endeavor, and she is always the first to arrive and last to leave the office. Ms. Farruggia Holt was previously a chief financial officer in the healthcare industry for over 30 years, and she made the transition into real estate because she aspired to be her own boss. She now attributes her success to her determination to putting her heart and soul into everything she does; she never leaves until the last employee is gone. She rolls up her sleeves and does what is needed to do to help people become successful. Savvy and commitment have allowed Ms. Farruggia Holt to thrive in the real estate business. She was recently chosen as a Professional of the Year in Real Estate by Cambridge Who’s Who, and she was also featured in Nursing Management Magazine. She expertly buys, renovates and sells properties in Maryland and Colorado, and over the course of a successful career, hard work, dedication, integrity, and a goal-oriented nature have allowed her to achieve her professional goals.